First we configure a prefix list to match just the 192.168.1.1/32 prefix. We then use that on our route-map as the match component, and then set the weight to 10. 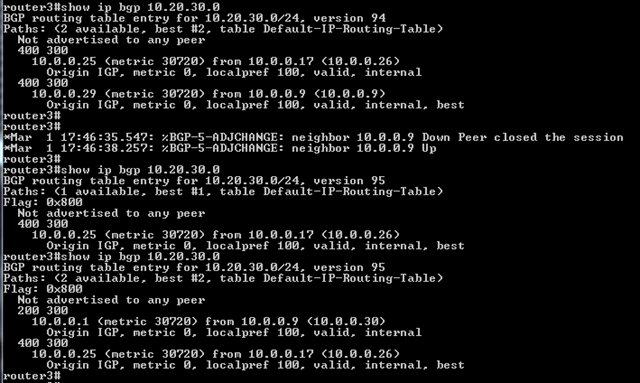 I then go into BGP and configure the route-map inbound on the 10.0.0.2 neighbor. It takes a second to apply, but in the second ‘show ip bgp’ output you can see that the route-map has been applied and that the 192.168.1.1/32 network is now preferred through 10.0.0.2. Note that since I didn’t add a second permit route-map entry that I no longer receive the 172.64.1.0/24 prefix from router4 since there is no match for it in the prefix list we created. 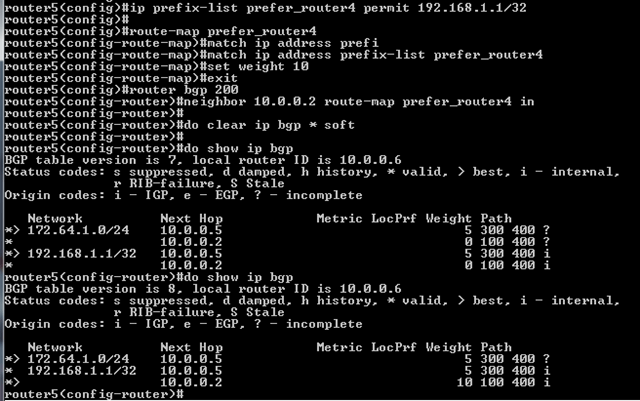 Note how router4 is now showing the LocPref of 300 for the routes from router2. Also note that the preferred path is now through router2 for both of the prefixes. Routes can be originated using the network, redistribute, and aggregate commands. 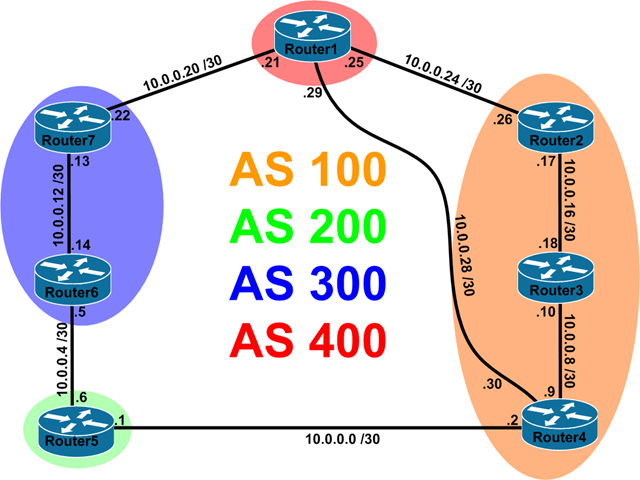 If there are multiple local BGP routes they are preferred in this order. If we were to use the network statement to introduce the prefix that would replace the aggregate and become the best path. 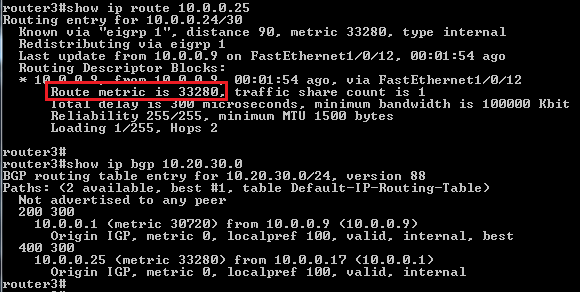 Router5 now prefers thee route through router4. Notice that router5 no longer has a route in the BGP table through router6. This is because router6’s best path is through router5. Router6 will advertise only the best path to the prefix and router5 will drop the advertisement since it sees its own AS in the AS-Path list. Here we look to see where the prefix came from. As we know, redistributed routes have an incomplete origin and routes originated via the network or aggregate commands have an origin of IGP or ‘i’. There’s also ‘e’ or EGP but that isn’t used anymore. That being said, BGP prefers routes that have an origin of IGP over routes that have an origin of incomplete. Let’s assume that we want traffic from AS 100 to enter AS 400 through the new link we just created. We can do this by advertising a increased metric from router1 to router2. Note that neither router3 or router4 actually have a path with the metric set to 100. This is because router2 is no longer advertising the route to 3 and 4 since it isn’t it’s best path. This is another rule that just makes sense. An eBGP learned route would be a quicker means to get out of an AS than following an iBGP route somewhere else in the AS to get to the prefix. If you have a eBGP route for a prefix you should use it over any iBGP learned routes for the same prefix. This step really just tells the router to check and see if multipath is turned on. If it is, it can select multiple paths and load balance across them. This doesn’t change the fact that the router will only advertise the best path to it’s BGP peers though. In the first output the path through the BGP next hop of 10.0.0.29 is the best path. If we clear the BGP session on router4, the route is withdrawn until the BGP session is rebuilt. In the last output we can now see that the path through 10.0.0.25 is the best path since it’s been there longer than the freshly installed path through 10.0.0.29. The age old tie breaker. If you get this far, your path selection probably isn’t of great concern to you.